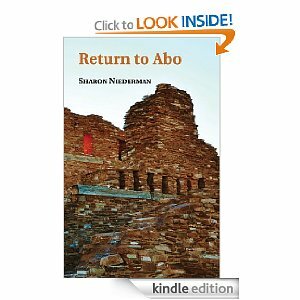 First published by University of New Mexico Press in 2005, Sharon Niederman’s debut novel, Return to Abo, is now available on Kindle form Amazon. Inspired by stories the author collected from New Mexico ranch women, the novel tells the story of three generations of women struggling to get along on a ranch in southern New Mexico. In the process, Maggie Chilton returns to her small town to make peace with all she fled twenty years earlier – her tough homesteader mother, the boyfriend who broke her heart, the best friend who betrayed her, and the constraints of small town life. She must also deal with her rebellious adolescent daughter, as she tries to re-invent a life on the dry, windy ranch that is her inheritance. The novel, set in the geographic and cultural heart of New Mexico, was named a Willa Award Finalist and won a First Place in Fiction from the National Federation of Press Women.